ANGELES NATIONAL FOREST >> Every weekend, thousands of visitors play in a 2.5-mile stretch of the East Fork of the San Gabriel River at Cattle Canyon. There, they bathe in pools created by self-made rock dams. While frolicking in the water, they inadvertently squash the babies of a protected fish species. And they strew plastic bags, fast-food wrappers and used diapers into and along the banks of the river. The heavy recreational use has resulted in an F rating for water quality from the Los Angeles-Area Regional Water Quality Control Board, the only spot in the San Gabriel River to violate the agency’s standard for excess trash. For more than 10 years, the Sierra Club, San Gabriel Mountains Forever and other groups have dreamed of improvements to the eyesore, only to be stymied by an overwhelmed and underfunded U.S. Forest Service. Momentum changed in October 2014, when President Barack Obama dedicated 342,175 acres of the forest as the San Gabriel Mountains National Monument, including the East Fork confluence at Cattle Canyon, about 14 miles north of Azusa. Two years later, the Forest Service produced an ambitious plan that includes new trails, river crossings, access steps, picnic tables, bathrooms and nearly 300 more parking spaces. Cleaning up Cattle Canyon and the East Fork would be a major milestone for the monument, part of the Angeles National Forest that gets 3.5 million visitors a year. But the project, estimated to cost $10 million to $15 million, is in search of funding, said Belinda Faustinos, retired executive officer of the Rivers and Mountains Conservancy who is a consultant to SGM Forever, a group of business, clergy, government and environmental leaders advocating for monument and forest improvements. “We don’t have a complete funding source,” said Rob Romanek, project manager with the Watershed Conservation Authority, but the agency has secured about $500,000 from the Forest Service for design work, he said. Faustinos said her group would work on applying for funding from ballot Measures A and M, tax measures approved by voters on Nov. 8 for parks and transportation, respectively, in Los Angeles County. The plan includes: a 2.5-mile East Fork Scenic Trail; six new access points leading down to the river (five staircases, one ramp); additional picnic areas at Coyote Flats and Heaton Flats adjacent to the river; 270 new parking spaces and three shuttle stops; more signs explaining how to keep a natural area clean and more trash bins, Romanek said. By adding picnic areas, people can eat while still viewing the river. “Now, people prepare meals right next to the water and their Styrofoam plates blow directly in the water,” he said. More trails would give people more to do than just sit in the river. Also, more trash receptacles would encourage proper disposal of waste, he said. “(The East Fork Scenic Trail) provides an opportunity to people with mobility challenges or to push a stroller or a walker along the river, still be able to enjoy it without going down into the river,” Faustinos said. The biggest issue is finding a balance between recreational use and environmental restoration and protection, Faustinos said. Getting folks to stop creating rock-dam pools that take the oxygen out of the water and kill the Santa Ana sucker fish is an objective, but keeping people out of the East Fork is not. “We want to encourage use but also good stewardship,” Faustinos said. To comment on the plan send an email to: commentspacificsouthwest-angeles@fs.fed.us Written comments can be sent to: Cattle Canyon Improvements Project, 110 N. Wabash Ave., Glendora, CA 91741. Romanek says the earliest the Forest Service will finish approval and the federal Record of Decision on the plan and its environmental impact statement is February 2018. WALNUT >> About 35 residents protested a hillside solar farm proposed by Mount San Antonio College by marching onto campus Monday and demanding the college president’s resignation. The crowd stayed for about 20 minutes, shouting “Scroggins must go!” and demanding the college reverse its position on building the solar project, which the residents say will lower property values, cause glare and destroy a natural hillside habitat. 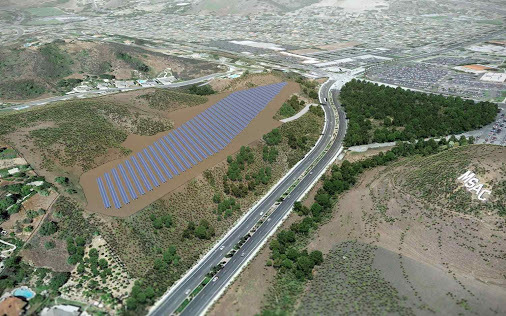 The college wants to level a hillside across the street from campus on the southwest corner of Amar Road and Grand Avenue to construct a massive photovoltaic array that would be one of the largest solar power systems in a Los Angeles County community. Mt. SAC plans on spending between $7 million and $9 million on the 11-acre project that would produce 2.2 megawatts of electricity and supply about one-third of the college’s electrical power, while cutting $480,000 from its annual electric bill. After distributing 50 letters to residents of Snow Creek on Stonybrook Drive, Regal Canyon Drive and Buckskin Drive on Friday, saying grading of the natural hills would begin Monday, the college reversed itself and indicated it had placed the project on hold. Since the city of Walnut and UWT had taken the college to court over this project and a proposed five-story parking structure (which the court placed on hold last year), the college said it wanted to wait until after the results of a court-ordered mediation session scheduled to begin Nov. 17. “The work on the solar project is on hold pending the mediation,” Scroggins told the angry crowd that gathered inside the plaza at Founders Hall, the administration building. When told some earth-moving equipment would be moved onto the east side of campus by next week, residents and members of UWT called it a trick and said they wanted zero work done until the judge decides the case. During the tense confrontation, Scroggins was asked by a member of the group if he would be willing to reconsider the location of the solar farm, something residents say should be put atop campus buildings and on carport structures. After first saying it was not up to him but to the college board of trustees, he said: “No direction has been given by the board or by me,” promising that the college is going into mediation with an open mind. However, the college rejected any alternative, saying “the west parcel,” land owned by the college since 1946, was best for the project. Photovoltaic arrays on rooftops or on carport structures, such as done by high schools, City of Industry and Metrolink, would cost more and would not produce enough electrical energy, explained Jill Dolan, director of public relations. She said the project is not using bond money from one of the college’s two recent improvement bonds. Instead, the college received funding from Proposition 39, a green-energy measure passed by voters in 2012. The college wants to fulfill the governor’s call to reduce fossil-fuel consumption and greenhouse gases that cause global warming. Before the march, about 50 protesters stood beneath the site on Grand Avenue waving placards and shouting slogans. They were joined by City Manager Rob Wishner, as well as council members Mary Su, Eric Ching and Andrew Rodriguez. Wishner said a city stop-work order, along with assurances from the captain of the Walnut Sheriff’s Station of enforcement, had an effect. The city contends the college must pull permits for the project, but the college says it is exempt. “I am hopeful we can put this dispute to bed,” he said. Wishner said he understands the residents’ concerns about Mt. SAC’s growth adding to noise, traffic and environmental degradation in the small city. “Now with about 60,000 students, it is beginning to have a quality of life impact on the community,” he said. He chastised the college for not doing a better job working with residents and City Hall. What had been usually a positive relationship has degraded these last two years, officials and residents said. Abou-Taleb put the blame on the president, there for the past six years. “Scroggins always wants to have it his way,” she said. Grading was supposed to have started Monday and be done in phases: clearing the site would have lasted until Nov. 15; major grading until June 2017; paving and landscaping until September 2017, and solar panel installation completed by late November 2017, according to Mt. SAC. Work would be done between 7 a.m. and 5 p.m. Monday through Saturday. LA PUENTE >> It’s official. John Solis will be installed as the newest member of the City Council on Tuesday. In the seesaw battle for the third city council seat, Solis edged out incumbent Councilman Charles Klinakis by six votes. Solis, who was trailing by 25 votes after the first count on election night, April 12, pulled ahead after more than 300 provisional ballots were counted the following week. A turn-around put him up by eight votes. By Friday, after nine more provisional ballots were tallied, his lead slipped. But Solis held on. The question of a recount — rumored to be possible, even probable over the weekend — was answered on Monday. Klinakis decided not to challenge the results. “After reviewing all the options, I feel it is best for the city and myself to put closure to this election and move forward,” Klinakis said on Monday. The one-term councilman said he had been thinking about asking for a recount but decided the stability of the city comes first. “Sometimes you just have to move on,” he said. Solis, 51, who is not new to the City Council, having served from 2000-2012, said on Monday he received a call from Klinakis saying he would not challenge the results. “I want to thank everybody for wanting me to come back and for believing in me,” Solis said on Monday, crediting his late surge to his walking the district until 4 a.m. the day and night before Election Day. At Tuesday’s 7 p.m. City Council meeting, Solis will take the oath of office after a four-year absence. Easily re-elected were: Mayor Dan Holloway, 1,194 votes and Councilwoman Violeta Lewis, 1,146 votes. The City Council will select a new mayor and vice mayor as well. Klinakis said he was disappointed by the number of negative mailers attacking him. But he said he accomplished what he set out to do during the past four years. He was proud of the way the City Council stabilized a city that was marked by a revolving door of administrators. He said his management skills helped install a new city manager, David Carmany, who has been on the job for 2 1/2 years. He said he would devote more time to his construction business, and also take more vacations. In the four years he has served on the City Council, he has not been back to his cabin in Alaska. “My wife said my first chore will be to shoot up to Alaska and catch her some halibut,” he said Monday. WALNUT >> The upcoming election of three city council members is being influenced by three political action committees formed exclusively to support or oppose candidates running in Tuesday’s election, according to the latest campaign filings. The use of independent expenditure committees are viewed as a spillover from the ongoing presidential campaigns where such committees are spending money on political mailers and advertising without coordinating activities with the candidates. The organizers of these PACs are empowered by the U.S. Supreme Court decision of Citizens United v. Federal Election Commission that honored political contributions as free speech and allowed unlimited election spending. According to a document filed March 31 with the Walnut City Clerk’s Office, the Truth & Dignity Municipal Leadership PAC spent $1,313.12 on a political mailer in support of challenger Betty Tang. This is the first time this PAC has existed in Walnut. Most likely, the committee is a reaction to two other committees formed this year to oppose Tang: Citizens to Protect Walnut Committee and Citizens for Family Values to Oppose Betty Tang for Walnut City Council 2016. Dana Hopkins, treasurer, who is listed as a certified public accountant from Riverside on the campaign document, did not return a phone call on Tuesday. Hopkins also is listed as the treasurer for Citizens to Protect Walnut, which has spent $820 in 2015, according to a document filed on Feb. 1, 2016. Contributors and their donation amounts to the “family values” PAC include: Patricia Anis of Diamond Bar, an administrative assistant for the California 48th District Agricultural Association ($750); Martin Arano of San Dimas, a handyman ($750); Gang Chen of Chino Hills, self-employed as Eden Electric ($750); Yan Lin of El Monte, a pharmacist with Walgreens ($750); Jaime R. Rodriguez of La Puente, a human resources manager with Hitchcock Automotive Resources ($749); Walnut City Council member Mary Su (from her City Council 2014 fund, $700). Since Walnut limits campaign contributions to $1,000 per individual, many will use PACs to get around that limit since PACs are an independent expenditure, said politics watcher and open government advocate Gil Aguirre. “How can you have influence and bypass many of the political campaign limits out there? This seems to be the technique chosen,” he said. • Eric Ching, 49, incumbent, raised $34,972.60 (including a loan of $7,171.60) and spent $10,231.94. • Bella Cristobal, 66, challenger, raised $28,169.60 (including a $5,000 loan from herself) and spent $22,917.55. Cristobal returned a $1,000 donation from David Hall, Mount San Antonio College trustee. • Dino Pollalis, 53, challenger, raised $12,100 all in loans from himself; spent $10,918.56. • Andrew Rodriguez, 23, challenger, raised $9,822 (including a $6,080 loan from himself) and spent $9,160. Rodriguez returned a $500 donation from Jay Chen, Mt. SAC trustee. • Betty Tang, 49, challenger, started with $61,680.32 of cash on hand; raised $11,986 and spent $41,798. • Nancy Tragarz, 53, incumbent, raised $7,128.77 and spent $4,370.70. WALNUT >> On April 12, residents of this upper middle class bedroom community surrounded by the San Jose Hills will go the polls to vote for three members of the City Council and whether to impose council member term limits. Since the last election, several issues have arisen, leading many to say this year’s voter turnout could be a record. A group called United Walnut Taxpayers formed in opposition to plans at neighboring Mount San Antonio College for a five-story parking garage on the edge of the Timberline neighborhood and an 11-acre solar farm on a prominent city hillside. The group has filed a lawsuit and so has the city. Though the issues aren’t decided, the effect has been a near total collapse of relations between City Hall and the college, which is entirely in Walnut, spread over 411 acres and with an overall student population of close to 60,000. A Feb. 19 candidates forum sponsored by United Walnut Taxpayers and the Chinese American Association of Walnut drew 200 people. A second forum is scheduled for 7 p.m. Tuesday at the Walnut Senior Center. “We’ve raised the level of participation in this city,” said Layla Abou-Taleb, founder of UWT. Second, 16-year Councilman Tony Cartagena is not running, meaning at least one new member will be joining the five-person City Council. These are just some of the factors raising the stakes for the election in April. The six candidates in alphabetical order are: Eric Ching, incumbent; Bella Cristobal, challenger; Dino Pollalis, challenger; Andrew Rodriguez, challenger; Betty Tang, challenger; and Nancy Tragarz, incumbent. He ran on removing the red-light cameras from the city, something the City Council agreed to do in May 2014. This year, he pushed for ballot Measure A that allows for a person to serve a maximum of three, four-year terms or 12 years, consecutive or not. The measure needs a majority of “yes” votes. It would not be retroactive. Of 31 San Gabriel Valley cities surveyed by Walnut staff, 22 or 71 percent have no term limits. Nine cities or 29 percent have term limits. Those with term limits are: Arcadia, Azusa, Baldwin Park, La Puente, Montebello, Monterey Park, San Marino, Sierra Madre and Temple City. On Mt. SAC, Ching, 49, said his concern extends to 60 different projects that could add traffic and congestion to Walnut streets. He also supported the recent decision to hire a new city attorney. He’s received $30,764 in campaign contributions as of the Feb. 27 filing. He added $10,000 in 10, $1,000 contributions, according to an addendum filed March 16. The retired financial analyst worked for Los Angeles County for 32 years and is a 30-year Walnut resident. Cristobal is on the city’s Parks and Recreation Commission. She is one of two candidates endorsed by incumbent council members Cartagena, Mary Su and Robert Pacheco. The other is Dino Pollalis. The three incumbents who often vote together on a frequently divided council did not endorse the two incumbents running for re-election. Cristobal, 66, also received endorsements from Republican leaders: Rep. Ed Royce and Assemblywoman Ling Ling Chang. She is opposed to Measure A, the term limits measure. She mentioned two issues specifically: Improving public safety by increasing volunteer patrols and adding amenities. “I want to move on with our project of the aquatic park,” she said. She received $18,974 in contributions as of the Feb. 27 filing. She received $250 each from Robert and Gayle Pacheco and Mary Su. She received $1,000 from Mt. SAC board trustee David Hall. In 2014, Pollalis, 53, ran an unsuccessful write-in campaign in which he picked up 196 votes for 2.8 percent. This time, the retired electrical engineer is on the ballot. He says he’d like to see more emphasis on public safety. He is a volunteer at the Walnut Sheriff’s Station. The 17-year resident of Walnut said he moved to the city to enjoy the semi-rural atmosphere. “Walnut is truly unique. Walnut is the place due to its open spaces and great family environment,” he said. He also serves on the city’s Mt. SAC task force. He has not accepted any campaign contributions. He has funded his campaign with $5,100 of his own money as of the Feb. 27 filing. Rodriguez, 23, is a product of Walnut Valley schools and earned a degree from Rutgers University. He works as a youth counselor at a nonprofit helping students qualify for college. He is in favor of reducing the number of students at Mt. SAC in Walnut by adding satellite classes in other parts of the district. “I am against the parking structure and I would prefer the college decide to move it somewhere else,” he said. He lives in Timberline, adjacent to the proposed parking structure site. Rodriguez also said he’d work to improve the look of Valley Boulevard and re-zone some parcels as commercial. He’s been endorsed by Mt. SAC trustee Jay Chen (who contributed $500 to his campaign), and Walnut Valley school board member Cindy Ruiz. As of the Feb. 27 filing with the city clerk, he’s raised $4,872. Tang, 49, is on pace to raise the most money in the campaign. So far, she’s raised $70,000, she said. <URL destination=”http://www.sgvtribune.com/government-and-politics/20140404/walnut-city-council-race-expensive-negative”>She spent close to $100,000 in 2014 and lost, coming in third behind Su and Pacheco. The comments are partly directed at Tragarz, who as mayor in 2014 and 2015 spent hours at each meeting criticizing City Attorney Mike Montgomery’s legal advice, credentials, lack of malpractice insurance and his invoices. Also, a July meeting over who should be appointed the ceremonial position of mayor caused more fighting among the council. Ching, mayor pro-tem, was passed over for mayor by Pacheco, Su and Cartagena who voted for Pacheco. The meeting ended with jeers from the audience. She, as well as Pollalis and Tragarz, mentioned stemming a recent 40 percent spike in burglary crimes in the city. She’s endorsed by Democrats Rep. Judy Chu and State Treasurer John Chiang, as well as Republicans, including Sen. Bob Huff and Assemblywoman Ling Ling Chang. She has numerous endorsements from members of the Diamond Bar and La Puente city councils but not from members of the current Walnut City Council. As a 43-year resident of Walnut whose involvement spans schools, regional boards such as Foothill Transit and the San Gabriel Valley Council of Government and community groups, she is the candidate most vested in Walnut and its government. Tragarz, 53, an attorney, recently took on the city attorney in some of the fiercest meetings in this small, normally quiet city government. As mayor, she spoke for hours about Mike Montgomery until just recently convincing the rest of the council to put the city attorney spot up for bid. Barbara Leibold, of the law firm Leibold McClendon & Mann in Irvine, became the new city attorney and began serving this month. “The Council can see I was right about all those things,” Tragarz said last week. Montgomery said he and the city agreed to part ways. He had served 36 years. “One of the council members had been attacking me on my billing. So I got tired of that,” he said. He has recently taken a job as city attorney of Maywood, he said. Tragarz attributed a spike in burglaries on the early release of prisoners as prompted by a federal judge, and on Proposition 47, which downgraded some nonviolent drug felonies to misdemeanors. Law enforcement officials said the new law added criminals to the streets and drove crime up. She and Ching are running on their record. She said the city is still one of the safest in California. Tragarz is endorsed by Royce, Huff, Ling Ling Chang, Councilman Ching as well as Helen Hall, Walnut Valley USD board member. As of the Feb. 27 filing, she’s raised $5,387. Mount San Antonio College will start grading a hillside in Walnut next month for an 11-acre solar-generating project over the objections of the Walnut City Council, according to college officials. College President William Scroggins said Monday he expects grading to start at the end of November or early December, apparently rebuffing repeated attempts from Walnut City Manager Rob Wishner and his staff as late as Monday afternoon to require a Conditional Use Permit. The college answered the city, saying it is exempt from the city’s zoning and permit ordinances. “We are not going to request a CUP,” said Scroggins, president and CEO of Mt. SAC, the largest community college in the state, located entirely in Walnut just west of Cal Poly Pomona. The city of Walnut and the community college have been locked in a battle over several developments at the college and whether the city should have a say. A neighborhood group sued and won an injunction against a college parking garage. The city also sued, saying any project that is not a classroom must go through the Planning Commission for approval. “The city will do everything in its power to make certain grading does not begin next month and does not happen until they go through our process,” Wishner said Tuesday. A clause in the government code gives the college the freedom to build energy projects without a city permit, Scroggins said. The city’s zoning laws say any public utility or other energy uses in a residential zone requires a CUP. The city considers such an exemption for “site specific” projects such as solar panels on one home or one building. Since Mt. SAC is building a 2.2-megawatt solar-generating facility with hundreds of panels on a 24-acre, college-owned parcel across the street at Temple Avenue/Amar Road and Grand Avenue, as well as an underground conduit to supply power to college buildings, this project should not be exempt from city zoning laws, said Michael Montgomery, Walnut’s city attorney. On Monday, the city asked the California Energy Commission if a college building a large solar photovoltaic project is exempt from local zoning laws. “Proposition 39 does not exempt any Local Educational Agencies from complying with local laws,” wrote Simon Fllippov of the CEC’s Prop. 39 Hotline, in an email to city staff. “We don’t feel that section (of state law) precludes Mt. SAC from having to attain local approvals,” said Tom Weiner, Walnut’s director of community development. In a meeting last week, the City Council struggled with how to stop the project or convince the college to build it within the campus, not near homes. The City Council asked staff to bring experts on the California Environmental Quality Act to its next meeting on Oct. 28. One of the issues involves taking dirt from the college’s Hilmer Lodge Stadium to the solar site and contouring the steep hillside to accommodate ground-level solar panels. Weiner estimated dump trucks carrying dirt would be crossing the city’s major intersection and traveling through Walnut streets five or six days a week for several months. “It would be an impact,” he told the City Council. The solar project will cost approximately $7 million and will eventually shave the college’s electric power bill by about $400,000 a year, Scroggins said. In the San Gabriel Valley’s largest school district, issues of budgets, aging school facilities and special programs such as the Chinese-language Confucius Classroom have surfaced in the past. Today, the Hacienda La Puente Unified School District seems to have moved forward, as surplus properties and funding more science and computer programs have come into play as election day rolls around Nov. 3. Chin, 73, is a psychiatrist who practices in Whittier. He has lived in Hacienda Heights for 43 years, having sent his two sons through HLPUSD schools. He would like to focus on improving mental health services in the schools and increasing safety on the campuses. “I want to make sure students are safe and secure from any violence going on in today’s world and help those with anger issues so they do not resort to vengeance,” Chin said. If elected, he would work on establishing ROTC programs in the high schools so students can learn discipline and acquire leadership skills. On campaigning, Chin said he would not spend much money. De La Torre, 46, has lived in Hacienda Heights 15 years. Currently a social studies teacher at Los Angeles Unified School District, he has also been an academic counselor and an intervention counselor. “I believe the board would benefit from someone with my experience,” he said. He would like to bring down class sizes at Los Altos High School by hiring more teachers. He wants to acquaint students with technology by providing laptop computers to every student. He has two children, ages 11 and 13. Guido, 53, lives in La Puente and has worked as a school bus driver for the Montebello Unified School District for the past 31 years. The main issues he sees in the district are student safety and providing more services for the homeless and for disadvantaged students, he said in an email. “There must be greater community involvement,” he said. He served on various committees with the Montebello school district. He is working toward a bachelor’s degree in human resources from the University of La Verne. Hornell is in his first year as a full-time German language professor at Fullerton College. Before that he taught Mandarin at West Covina Unified School District. He wants to enhance the district’s STEM program (science, technology, engineering and math) and stop the flow of HLP students to Walnut and Fullerton school districts. “A lot of people tell me we sent our kids to another district because they have better programs there,” he said. Kwok, of Hacienda Heights, won a seat on the board in 2011 and is seeking his second, four-year term. He is a trial lawyer and also teaches law. Kwok, 52, said he is running on his record, which includes implementing improvements to campus buildings and athletic fields, as well as new surveillance cameras and fire alarms. He’s proud he and fellow board members established computer programming classes at the high school level but wants to see the curriculum expanded to middle schools. He’s visited every school site and has attended 250 events during his tenure, he said. “The biggest accomplishment I can ever have is uniting our community for all of our children,” he said. Kwok also donated 1,000 musical instruments to the district and helped start dual-immersion language programs that incorporate music instruction. Medrano, 26, grew up in Hacienda Heights and graduated from Los Altos High School. He is an aide to Assemblywoman Cristina Garcia, D-Bell Gardens. Medrano said he would focus on more support for arts funding and reducing class size. He hopes to spend about $30,000 on the campaign.